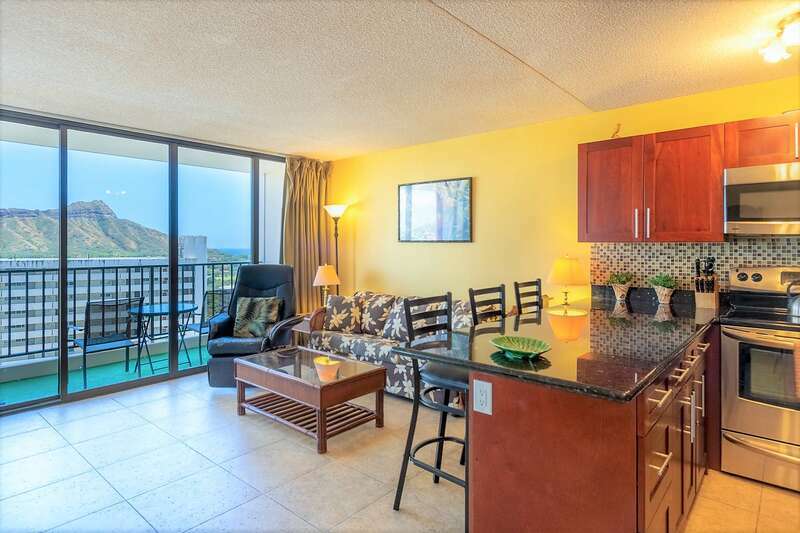 Watch the surfers from your lanai in this updated partial ocean view suite. 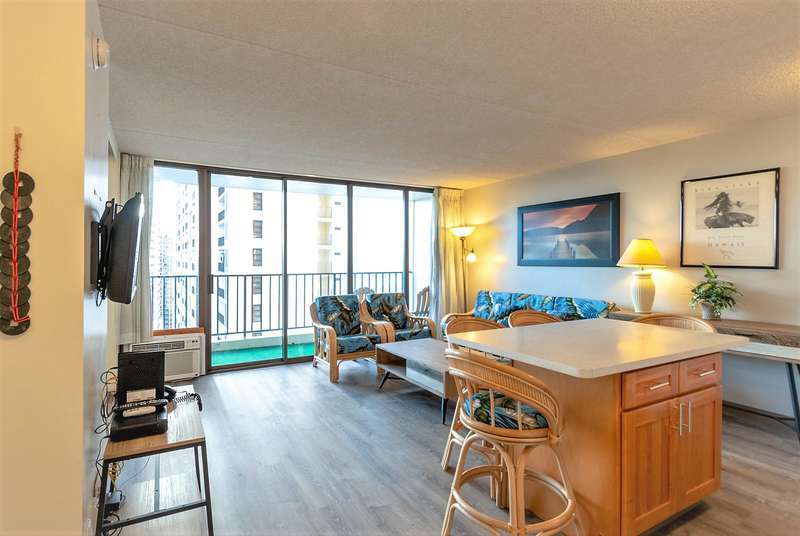 Newer appliances and modern furniture make this condo suite comfortable. Enjoy the comforts of home at an affordable price! Gorgeous view of the Ocean and Mountains. 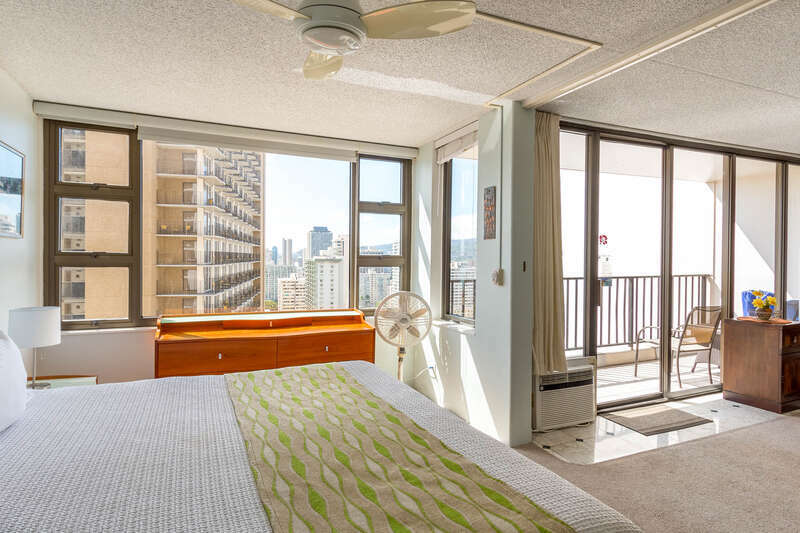 Many rentals in Waikiki have not been updated since the 1970s and it shows! Enjoy a fully-equipped kitchen and comfortable seating in the living room. Kitchen includes side-by-side refrigerator with door panel, range, microwave, rice maker, coffee maker, and other kitchen wares. The extended island has seating for four people. Sleeping arrangements include a queen-size bed in the bedroom. If additional sleeping capacity is needed, there are high-quality air mattresses available for rent. This condo is one of the few units with a ceiling fan and also a desk in the bedroom. The bathroom has more storage and a larger mirror than most Banyan units. It is tiled floor-to-ceiling. Plus, there is a hand shower for your comfort.